JANAT’s Tea for Two caravan is the world first caravan sharing love and time with tea. JANAT believes that tea is a message of love, offering an opportunity for a relaxing time to deepen love and trust with the surrounding people. 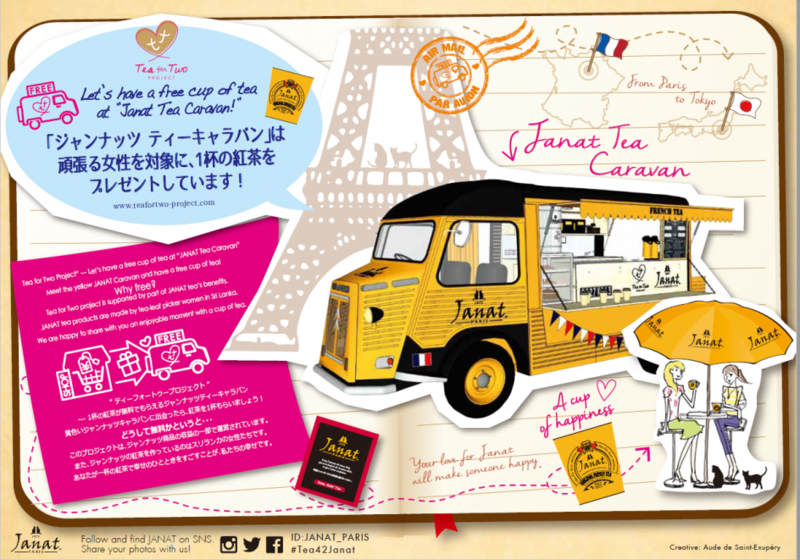 On its journey, JANAT’s Tea for Two caravan is offering a free cup of tea to every woman who cross its path. Tea for Two project is supported by part of JANAT tea’s benefits. Women are the backbone to every families and societies. JANAT tea products are made by tea-leaf picker women in Sri-Lanka for generations. We are happy to share with you an enjoyable moment with a cup of tea. The world’s first love and time sharing tea caravan. JANAT believes tea is a message of love and time slowing to establish trust and love with others. For each box of JANAT tea sold, the caravan will offer a free cup of tea to a woman. Women are the foundation of our Society and by giving them some time and love, they will give back their best to family and society. JANAT PARIS products are made by more than 1000 women tea-leaf pickers in SriLanka. We are happy to share a few minutes of your precious time and engage you into the power of love for others.